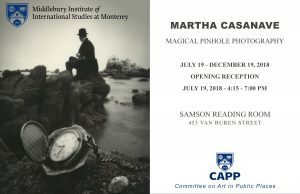 The Committee for Art in Public Places at MIIS will feature 10 images by photographer Martha Casanave starting July 19 in the Samson Center Reading Room. Casanave’s work includes dreamy images of Leningrad in winter in 1988 using a pinhole camera (film camera with no lens) as well images of Monterey and the Central Coast of California. Those on the MIIS campus or in the area are invited to an opening reception from 4:15-7pm in the Samson Reading Room Thursday, July 19. The exhibit will be in conjunction with a visit later that week from the former US Ambassador to the former Soviet Union 1987-1991, Jack Foust Matlock Jr.
For more information, contact Eduardo Fujii at efujii@miis.edu or visit http://sites.miis.edu/arts.